The public’s right to know is on a collision course with Paul Krebs’ prerogative to keep certain things secret. The University of New Mexico Athletic Director is attempting to resist journalistic scrutiny into Lobo sports, by engaging university lawyers and calling out potential leaks in his own department. Krebs also met with UNM’s attorneys; the school’s chief marketing officer, Cinnamon Blair; and Deputy Athletics Director Brad Hutchins to discuss the recent release of student-athlete exit interview notes to NMFishbowl.com. 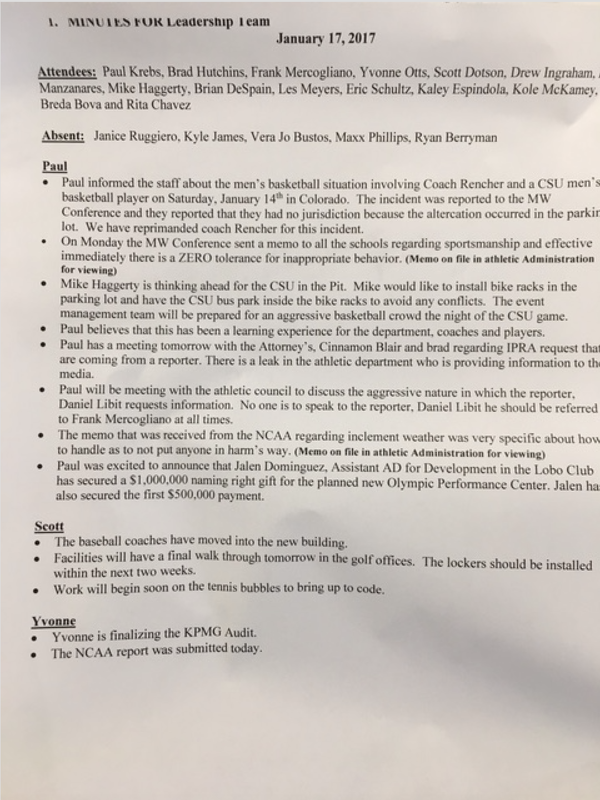 Furthermore, Krebs issued a dictate that no Athletic Department employee is permitted to speak to this reporter, and that all communications must go through Lobo spokesman Frank Mercogliano. Athletic Department sources say that in recent weeks, Krebs has been adamant about department employees refraining from emailing certain kinds of information, for fear that it may materialize in a public records request. NMFishbowl.com has sent several requests for interviews and comments to Krebs since the website launched in November. Since then, Krebs has only replied once, by email, to a question about his dealings with WisePies owner Steve Chavez. Krebs’ discussion about the university’s IPRA procedure came in the wake of NMFishbowl.com’s recent report on the notes of student-athlete exit interviews. “The meeting with the attorney was to gain a clarification as to why confidential student-athlete exit interviews were included in an IPRA request when they were specifically marked confidential, and the fact that student-athletes are not state employees,” said Mercogliano. Blair said that she ultimately did not find there to be anything improper with how the university released materials. NMFishbowl.com has since alerted UNM to its plans to publish additional revelations from exit interviews in the near future. The university, as a public institution, is subject to the New Mexico Inspection of Public Records Act, which requires the school to provide public records except in certain, limited circumstances. This website has made dozens of IPRA requests, some of which have been denied, redacted or determined to be immaterial. Last year, the university instituted a new provision that stipulated a copying fee for records that exceed 20 pages. Separately, last week’s minutes also reveal UNM’s discussions for how it plans to handle the upcoming men’s basketball home game against Colorado State on Feb. 21. On Jan. 14, two Lobo assistant coaches were ejected at the end of the UNM-CSU game in Fort Collins, whereby assistant Terrence Rencher was later reprimanded for his role in a post-game spat with a Rams player. For CSU’s return visit, UNM is contemplating a plan to erect a barricade of bike racks around the opposing team’s bus, as a means to provide additional security. “The event management team will be prepared for an aggressive crowd the night of the CSU game,” Krebs said, according to the minutes. Emails sent Monday evening to Krebs, seeking comment for this story, were not returned by publication. If you would like to send tips, anonymous or otherwise, please do so through this website’s contact form or by emailing editor@nmfishbowl.com. The owner of WisePies has another company that's done $1.6 mil worth of contract work for UNM since 2013.